Over 40 million Americans take 5+ prescription meds a day—but only 50% of Americans take them as prescribed. According to the founders of PillPack, patients who fall into the category of having multiple prescriptions face the challenge of unsynchronized renewals, inadequate oversight from pharmacists and challenges staying on top of insurance billing and the number of available refills. Additionally, there is the obvious problem of remembering which medications are to be taken at a specific time and tracking if they have actually been taken. And many patients also have caregivers who need to be included in medication management. PillPack attempts to solve the challenges of multiple prescriptions by streamlining the front end of the pharmacy experience. The group medications into the simplest schedule possible in easy-open packs for patients (and their caregivers). Because the PillPack makes it easy to know if medications for a schedule have been opened, the challenge of sharing caretaking duties for a patient is also made easier—it’s not as necessary to have pen & paper or online tools for tracking adherence to a prescription schedule. Additionally, an online portal for the patient and/or their caregivers allows for easy administration without requiring a trip to a pharmacy or lengthy phone calls. PillPack is designed to support both patients and their caregivers—allowing them to better manage schedules for medication, link accounts for updates, and reduce the worry related to complex medication schedules. Pharmacy OS is the system PillPack operates on, coordinating caregivers, patients, payers, pharmacists and doctors. Together, PillPack and PharmacyOS have the potential to disrupt the pharmacy industry by optimizing the experience of the large portion of Americans who need to manage multiple prescriptions. It solves several parts of the challenge of adhering to complex schedules from the patient & caretakers’ perspective, reduces the risk of over-spending, renewal surprises or unexpected expenses for patients and insurance payers, and minimizes challenges requiring the last-minute contact of the prescribing physician. Forward is a startup based in California combining the ‘best technologies’ for health with personalized care. Their approach promises to blend advanced diagnostics, including genomic testing, with more face-time with doctors and care providers. Additionally, patients can co-create health goals with their provider and receive personalized care through telemedicine (in this case, chat-based messaging) to attend to health concerns early while minimizing unnecessary office visits. Forward’s offices look and feel different, too. Visitors could easily pass by an important innovation which sits innocuously built into the wall—some airport water bottle refilling machines are fancier. Behind the simple facade lies a clever combination of existing diagnostic technologies in a ‘one stop’ place for basic diagnostics. Once in the doctor’s office itself, patients can expect to be discussing their health situation on very large screens with casually-dressed professionals. Overall, the effect is far more Star Trek sickbay than one-stop family care clinic. The VC-backed firm has a difficult path ahead. It will have to convince patients to spend a significant amount of money each month on a subscription model of $149/month, in addition to costs per visit (and for diagnostics). And it will likely have to convince payers to cover somewhat unusual diagnostics (like genomic testing). But if it can, the promise of highly personalized care backed by solid patient data is certainly worth the effort—and could scale as technology costs lower and larger collective purchasers bring their business. PatientsLikeMe offers a new approach to viewing your own health information, called DigitalMe. DigitalMe combines Biological, Experiential, Medical & Environmental data to create a profile of an individual, which is then aggregated with other ‘little data’ about other individuals into ‘big data’ sets. By contributing data, patients hope to receive meaningful feedback on opportunities to better treat or manage their own condition at the same time as helping others. Share, find and learn: patients can share about their experiences, as well as submit quantified medical data (like health records), biological data (like blood samples) and data about their environment. Currently, PatientsLikeMe says they have over 600,000 members reporting on 2,800+ conditions. Patients have the opportunity to interact with others with the same condition to directly share experiences and data, and can also seek research/clinical trials. PatientsLikeMe partners with “companies that are developing or selling products to patients.” According to the company, these products may include drugs, devices, equipment, insurance, and medical services, with the aim to improve health care. One such partnership was with Walgreens.com, where they cross-referenced their data with Walgreens’ drug data. Clinicians are perhaps less-represented on PatientsLikeMe outside of the context of research. 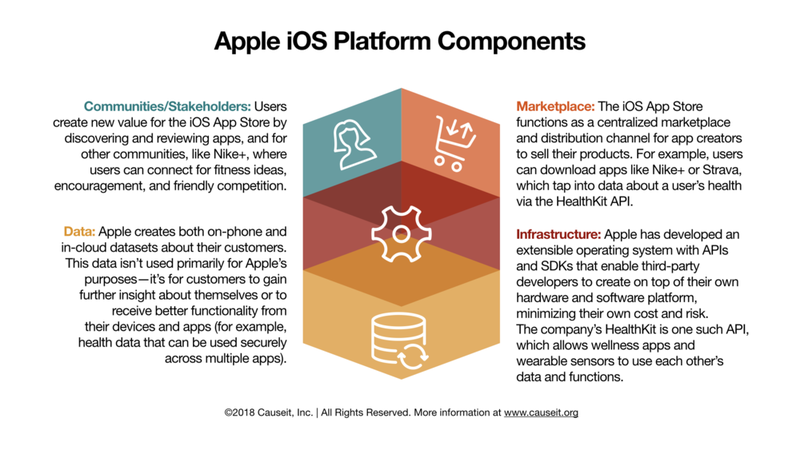 There may be opportunities to further that integration for care programs, much in the same way that Apple’s CareKit clinician-liaison infrastructure emerged from ResearchKit, their research-liaison framework. Researchers can apply for access to data about their members of PatientsLikeMe, and can partner with PatientsLikeMe to conduct tests, as they did in a trial with The Duke ALS Clinic. It is not entirely clear from reviewing PatientsLikeMe’s materials is the degree of integration they offer to third parties. 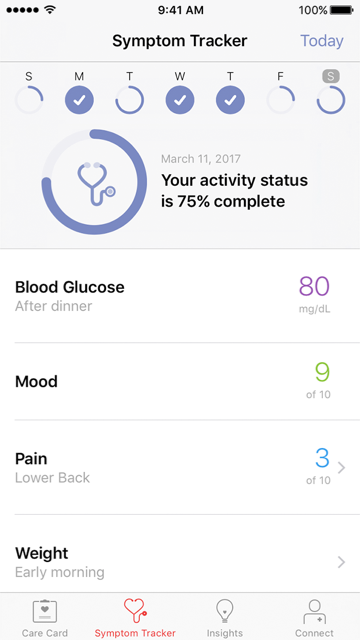 For example, is it possible to easily integrate their data with Apple's HealthKit and CareKit, from the patient and medical professional’s perspectives? 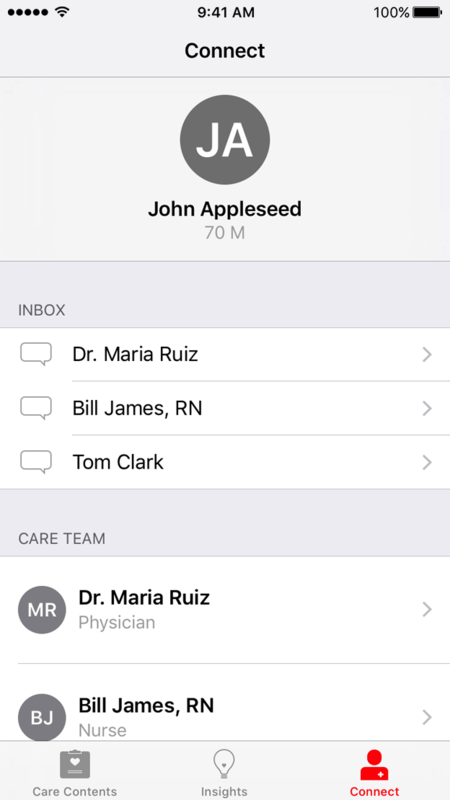 Can research projects integrate with Flatiron Health’s approach to large-patient-base research projects, or Apple’s ResearchKit framework for opt-in medical studies? The company indicates that it is ‘in trials’ of integrations with wearable technology devices (presumably like Apple Watch, Fitbit or Android Wear devices). They also indicate pilots of electronic medical record integration. More than 600,000 people use PatientsLikeMe to find new options for treatments, connect with others, and take action to improve their outcomes. PatientsLikeMe partners with Jun Wang's iCarbonX to apply next generation biological measures and machine learning, and accelerate a deeper understanding of the basis of human health and disease. PatientsLikeMe announces a collaboration with M2Gen to give patients and researchers a more complete picture of patients’ experiences with cancer treatments and to shed new light on the factors that may affect outcomes and quality of life. Datasets at PatientsLikeMe tend to be focused on complex conditions and include many factors. This can be a boon to researchers looking to attend to environmental and social factors affecting research participants, but can also be challenging to ‘control’ for in a study. PatientsLikeMe stands to bridge the genomic testing science of groups like HudsonAlpha with the community elements of CaringBridge. It’ll be interesting to see where this goes. The angle PatientsLikeMe takes is more akin to sickness care—their videos and on-site materials focus on people grappling with significant conditions, like post-traumatic stress disorder, multiple sclerosis, fibromyalgia or massive depressive episodes. However, since many people may not find a need for this service until a serious condition enters their life or that of a loved one, it makes sense as a starting point. 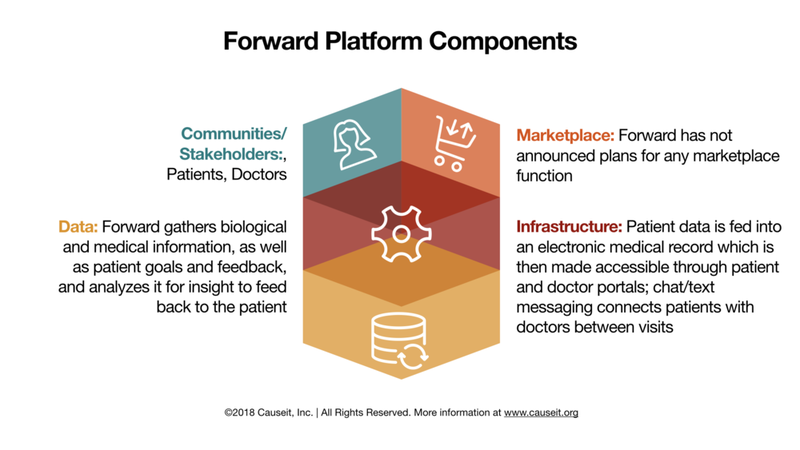 The promise of the platform is huge, though—and when combined with other platforms, it could provide exponential value to patients, clinicians, researchers and medical organizations. Automakers are making their own forays into the digital space. Once the domain of third parties, carmakers themselves are getting into the game. Here we briefly look at the strategic partnerships, pilots and internally-led innovations carmakers are working on, as well as new business models for car sharing (wherein multiple parties own one car, or a corporation owns a car and rents it out fractionally, permitting use by a larger group of people). What it is: A peer-to-peer ‘social insurance’ company based in Germany that invites customers to opt in to a group policy which is shared between friends. How it works: Each group policy includes a pool of money, fed by a percentage of each member’s premium, which can be used to pay out small claims. If, at the end of the year, there is money left in the pool, everyone gets their share of the remainder back. Why it's disruptive: Part of the premiums still go to regular insurance, but the idea of money back each year underwritten by the desire to do right by your friends is an unconventional and attractive value add—especially for people who see in their cultural identity collaboration, community and “pay only for what you use”. In 2013, roughly 90 percent of users who took advantage of the peer-to-peer-insurance model were repaid contributions. With Apple's recent announcement of their direct sales of not just smartphones, but phone & plan bundles, mainstream customers are about to experience a big, visible change in mobile business models. While lots of articles do a great job comparing Apple's new iPhone Upgrade Plan to similar carrier-specific offerings, there's another issue at hand behind the scenes as Apple closes the loop of the iPhone experience. Work in the realm of cyborg anthropology means listening. Rural broadband access is a vital part of lessening the 'digital divide' between the know and known-nots—people who have access to the wealth of information, especially multimedia, on the web. Software used to be sold as any other product: a box on a shelf (or a download equivalent) and either basic post-purchase support or paid support contracts. Users would have to wait for a new release to get new features. I keep coming back to the question of "how does nature handle IP?" The closest I can think of is our creation of APIs. Organisms don't walk around with their genetic code sort of displayed for everyone to see, what makes them unique. But there is massive and constant interaction between organisms and their environment, and exchange of information. I think APIs, in a way, are sort of an interesting way of thinking about that. You display enough information about your internal code that others can really interact [with it], and build upon it effectively, without giving away the whole farm—which probably wouldn't even be useful. The other organisms don't even need to know your entire code. That piece is interesting to me. And what I would say is that there is a unique opportunity right now for companies to, as a first step, to start to embrace the social enterprise—because what that does is that gets the value of the human component quantified, and from there we start to make decisions, we start to put in structures that are not 100% based on just what the profit and revenue growth are. Those things become an end, an outcome.